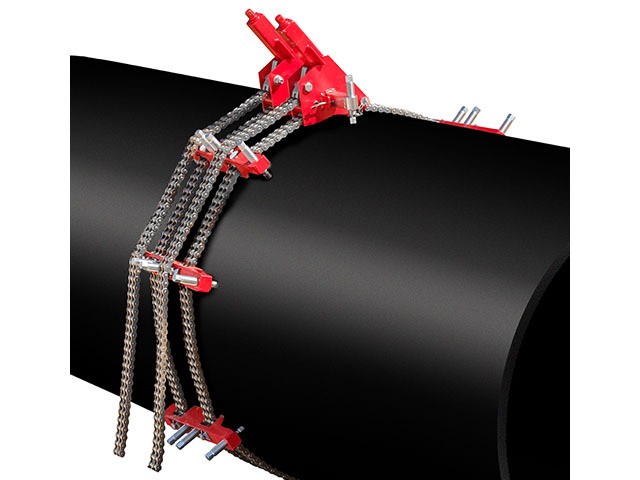 The Sawyer Double Chain Clamp is designed for aligning and reforming pipes and vessels up to 6 meters (20′) in diameter, up to Schedule 80. If no reforming is required, then the clamp can be used to align over Schedule 80. Specialized heavy duty jack bars and main blocks can deal with even the most difficult of reforming jobs. The clamp can be supplied for use with any pipes, including stainless steel, and all Double Chain Clamps are supplied in their own custom made storage boxes. Clamps can be supplied with an optional level and support device, or a pull lift (come along) for larger pipes if required. Clamps are supplied with a torque wrench as standard. This is set to ensure the correct pressure (150mm) is applied to the chain, unlike hydraulic systems which risk stretching the chain and/or applying too much pressure to the pipe; risking the integrity of the clamp.